Austin Cycling News » Stuff I found on the web » The NY Times really do have it out for cyclists. Now they are nitpicking on Lance Armstrong. How much water do all the other rich people use? Did a bicycle run over your puppy James? First on August 11, they post this gem now they “care” so much about the environment that they single out a rich guy all the way over in Austin, TX. How much water does Donald Trump use in his mansion? Where is the story of his excesses? 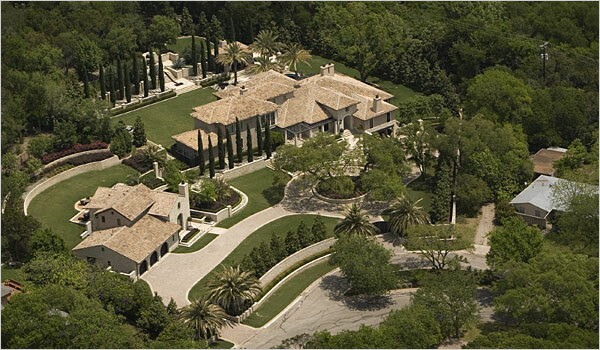 Lance Armstrong’s Austin home, with a swimming pool and an acre of gardens, used 330,000 gallons of water in July. HOUSTON — Lance Armstrong is one of the favorite sons of Texas and a model citizen known as much for his social conscience as his cycling. So it came as a surprise when it was revealed this week that he is one of the biggest individual users of water in Austin, where he lives. In July, Mr. Armstrong, who won the Tour de France seven times, used a whopping 330,000 gallons of water at his lush Spanish-colonial home, with an acre of gardens and a swimming pool, city water authority officials said. This tremendous flow of H2O, which is 38 times what the average household in the city uses in the summer, comes as Texas is going through a dry spell and officials are asking people to cut back on watering their lawns. “We are definitely short on rain,” Lisa Rhodes, a spokeswoman for the authority, said with a sigh. Mr. Armstrong declined to be interviewed. He has been in Colorado and California all summer and only noticed the surge in water use when he saw his bills go up, his spokesman, Mark Higgins, said in an e-mail message. (The bill for July was $2,460.) “Lance and all the folks involved are looking into it and will for sure get it under control,” Mr. Higgins wrote. But city water records suggested that his home has long been a guzzler of water, using an average of 158,000 gallons a month since January 2007. Then, in June, the cyclist shot ahead of the pack, topping the city’s list of residential water users for the first time, officials said. That month his house and garden drank up 222,900 gallons. Daryl Slusher, an assistant director of the Austin City Water Authority in charge of conservation, said the city had ruled out a leak. Mr. Slusher offered to scrutinize Mr. Armstrong’s irrigation system and perhaps recommend native species that require less water. Getting Mr. Armstrong on board with water conservation would be a public-relations boon, Mr. Slusher said, although it was a disappointment that Mr. Armstrong had ended up on the top of the city’s water-gluttons list.